The studio that spent 12 years unable to finish Duke Nukem Forever and the one that finally did in 2011 are back in court again, this time over a Duke Nukem game for PC and PlayStation that was teased earlier this month. 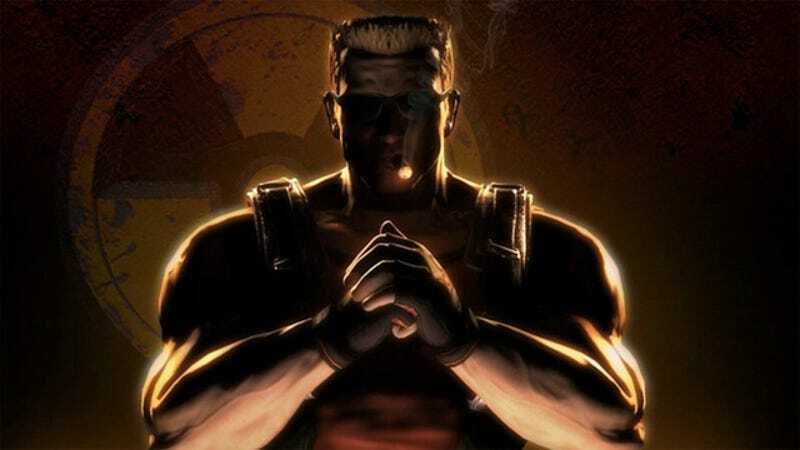 Gearbox Software, which in 2010 acquired Duke Nukem and the rights to it from its creator, 3D Realms, is suing 3D Realms over something called Duke Nukem: Mass Destruction, which came to light earlier this month in a teaser site that quickly disappeared but has since returned. Gearbox's suit says the game was being made, without its knowledge or permission, by 3D Realms and was to be published by Interceptor Entertainment, a Danish firm also named in the filing. "Apparently, after selling its Duke Nukem IP rights to Gearbox in 2010, [3D Realms] sought to privately convince others that the sale never happened," the lawsuit alleges. It says 3D Realms and Interceptor "colluded to misappropriate and make infringing use of the Duke Nukem trademarks and copyrights owned by Gearbox," an acquisition the lawsuit goes to great lengths to describe as a favor to the beleaguered 3D Realms "famously incapable" of delivering Duke Nukem Forever even after 12 years of development. Gearbox notes that its acquisition of Duke Nukem in 2010, which entitles it to all future development of anything using its name or characters, bailed 3D Realms out of a situation in which publisher Take-Two Interactive was suing to recover the money it had put into Duke Nukem Forever's development. The filing openly insults 3D Realms' work on Duke Nukem Forever, saying the game code Gearbox acquired was "sorely deficient," also describing it as "a technological jigsaw puzzle of a video game. "The mountain of problems subsequently uncovered by Gearbox cannot be captured in this single pleading." Gearbox is seeking the full span of damages, including punitive (as well as "exemplary" damages, another type of punishment), and a judge's order to stop Mass Destruction from ever releasing. Gearbox's lawsuit says the game was due to launch on Feb. 25, however, that was only the date a countdown timer at AllOutofGum.com was set to expire. Its actual release date was never said. This is not the first time these two sides have gone to court; 3D Realms sued Gearbox last year, alleging it was owed $2 million in royalties and advances Gearbox had received for finishing the game. The suit was later dropped with a profuse apology by 3D Realms co-founder Scott Miller, a statement that, notably, was circulated to the press by Gearbox. Incredibly, admissions and apologies from 3D Realms already feature in this latest lawsuit. Gearbox's filing includes a declaration, signed by both Miller and co-founder George Broussard, in which they acknowledge Gearbox's exclusive ownership of Duke Nukem and that Mass Destruction violates the rights they sold to Gearbox in 2010. "I apologize to Gearbox for the infringement and breach represented by my efforts," reads the declaration, dated Feb. 16. "I acknowledge that 3DR's actions, which were taken at 3DR's behest, constitute a material breach of the Duke IP terms that cause irreparable harm to Gearbox and its Duke IP rights," the statement says. "By willfully and materially breaching the [asset purchase agreement] and related Duke IP Terms, I agree that Gearbox is entitled to all legal and equitable remedies against [3D Realms]." The declaration, dated Feb. 16, is made "with sincere apologies for my actions." "Gearbox graciously accepted the apology," says the lawsuit, filed Feb. 21 in federal court for the Northern District of Texas. Kotaku reached out to Broussard via email to ask why this lawsuit was proceeding if he and Miller apparently already admitted wrongdoing, apologized for it, and promised to stop. A response was not received as of publication time. Any further comment from Broussard, Miller, 3D Realms or Interceptor will be updated here. Update, Feb. 24. Frederik Schreiber, the CEO and game director for Interceptor, replied to Kotaku: "We are aware of the lawsuit that has been filed against 3D Realms and Interceptor. It's an unfortunate situation, but we have acted in good faith and are working towards a resolution. We're not all out of gum." George Broussard also replied to acknowledge the request for comment but say that he could provide none at this time. The original post follows. Gearbox's comment was essentially limited to providing reporters copies of the lawsuit and its attachments. Duke Nukem: Mass Destruction was to have been a "top-down role-playing game." The teaser site AllOutofGum.com appeared around Feb. 1 with a countdown set to expire on Feb. 25. That page presented a block of coded text, promising to reveal it if the game got 10,000 likes on Facebook. Fans decrypted the text anyway, revealing a pitch describing the game as "an Unreal Engine-powered galactic adventure to save the President from an apocalyptic alien threat." Eurogamer noted that Miller was said to be working on a PC and PS4 project back in December. AllOutofGum.com did not specify whether PS3 or PS4, or both, was getting Mass Destruction. This also isn't Interceptor's first scrape with Gearbox over who can make a Duke Nukem game, either. Interceptor was to have published the fan-made Duke Nukem 3D ReloadedDuke Nukem 3D Reloaded but ended the project in 2011. In a statement at the time, Interceptor asserted it still had a noncommercial license "to use the Duke Nukem brand for our creative ambitions." Gearbox released Duke Nukem Forever on June 14, 2011. It was a critical bomb but ultimately was profitable for Take-Two, possibly thanks to the notoriety the name acquired over a dozen years in which the highly anticipated sequel to Duke Nukem 3D was built, torn down and started over repeatedly.